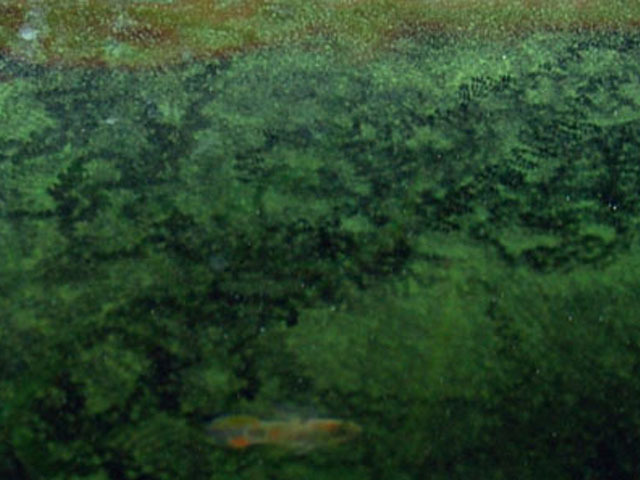 This algae guide is mainly aimed at the high light tank being dosed by Estimative Index. Description Often grows on leaf edges of slow growing plants, bog wood and mechanical equipment. 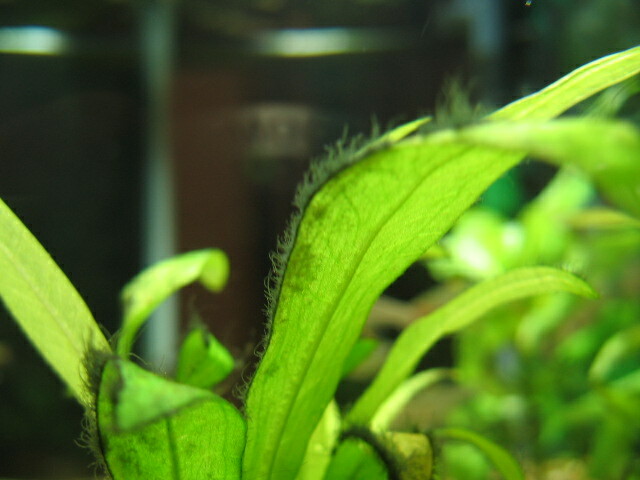 Also sometimes it grows in fast flowing areas of the tank. Grows in clumps or patches of fine black tufts up to about 0.5cm long. Cause In a high light tank it is an indication of low or fluctuating CO2 levels or not enough water circulation around the plants. In a low light tank it is often due to changing CO2 levels. 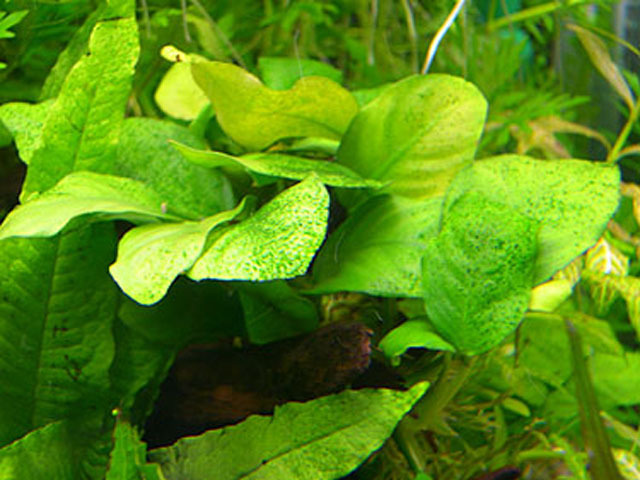 Removal In a high light tank you will need to increase your levels of CO2 and/or improve water circulation around the plants. Scrub and cut off as much as you can first. Increase levels slowly to 30ppm or more but watch the fish to see if they are respiring heavily. Make sure you have good water flow around the whole tank along with some good surface movement. Adding a powerhead may help. If you have a low light tank without CO2 injection then not doing any water changes will help. This is because tap water often has lots of CO2 dissolved in it which causes CO2 levels in your tank to fluctuate. The algae respond to this a lot quicker than the plants do. 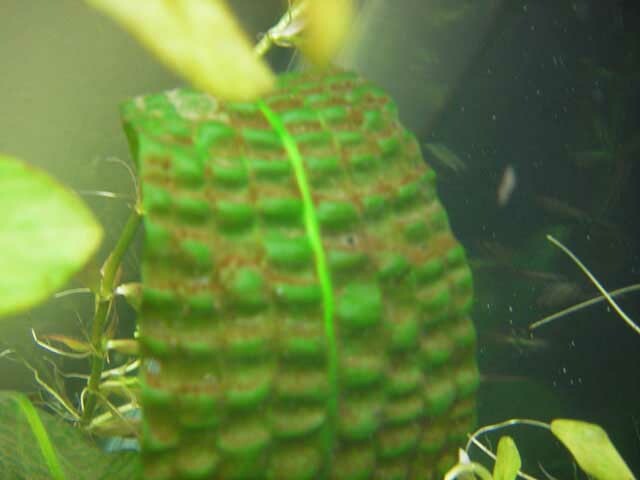 Siamese Algae Eaters are known to eat BBA so can be used to control this algae. Overdosing Flourish Excel, EasyCarbo or TNC Carbon will clear it up. Description This isn't a true algae, but a bacteria called cyanobacteria that is able to photosynthesise. Covers everything in a blue/green slimy mat. Easily peels off but grows back again very quickly. It can smell pretty foul. 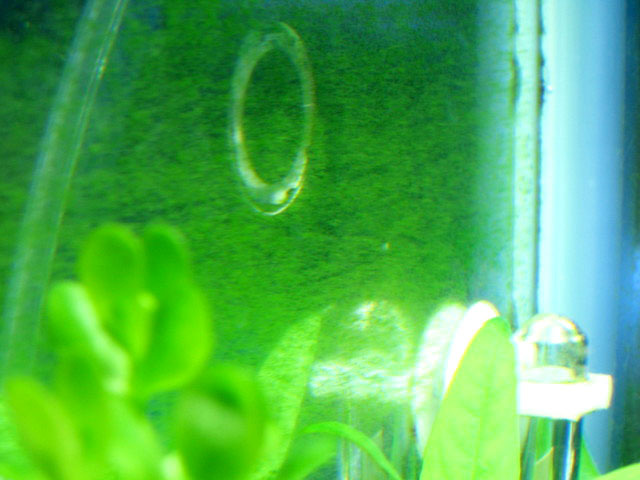 It is very commonly found in the substrate and especially along the front glass where is receives light. Cause Often caused by very low nitrates. 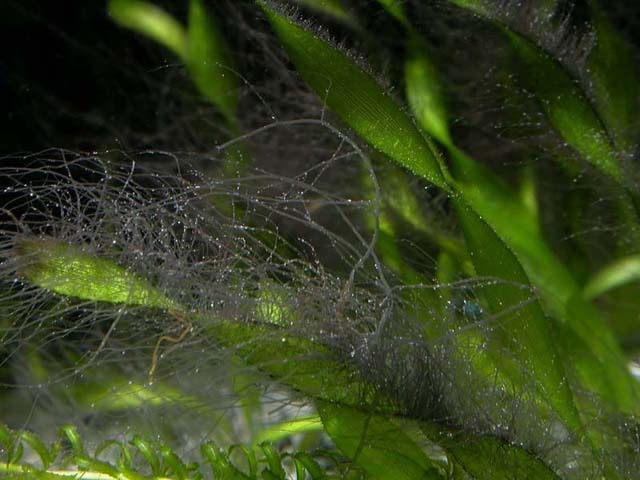 It is fairly common to have it growing in the substrate against the front glass from where it can spread. Sometimes it appears with new setups that have had light and ammonia present at some point. Dirty substrates and filters may also bring it on. Poor water circulation is another possible cause. Removal A blackout is the best method for this. 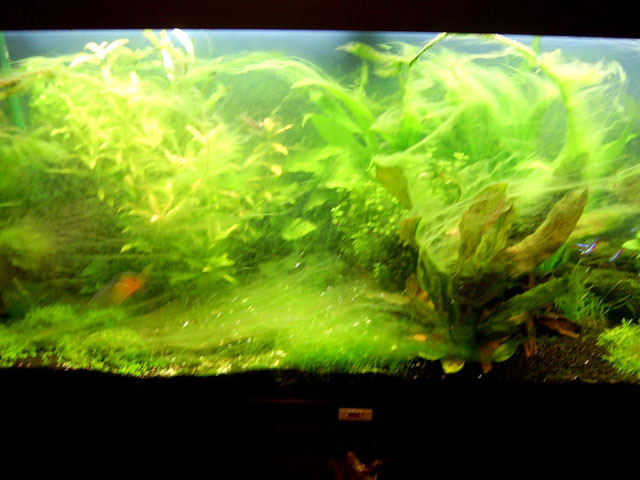 Clean out as much of the algae as you can and do a 30 to 50% water change. If your nitrates are low then add some potassium nitrate to get levels to 20ppm. Remove CO2 and add an airstone. Turn off lights and cover the whole tank so no light can enter. Leave it for 3 to 4 days. No peeking and no feeding - fish will be fine without food for this period. After 3 to 4 days remove the covers and do a 30 - 50% water change. Remove airstone and start CO2. You will need to dose nitrates to keep them dropping too low again. Make sure your substrate and filter doesn't become too clogged up with mulm and also make sure you have good water circulation around the whole tank. Another option is to treat with Maracyn which is an anti-biotic. Seems to work well but may affect the biological filter. In the UK it is illegal to purchase Maracyn without first getting a prescription for it from a vet. If the BGA is originating from the substrate place some dark tape on the glass to hide the substrate from direct light. 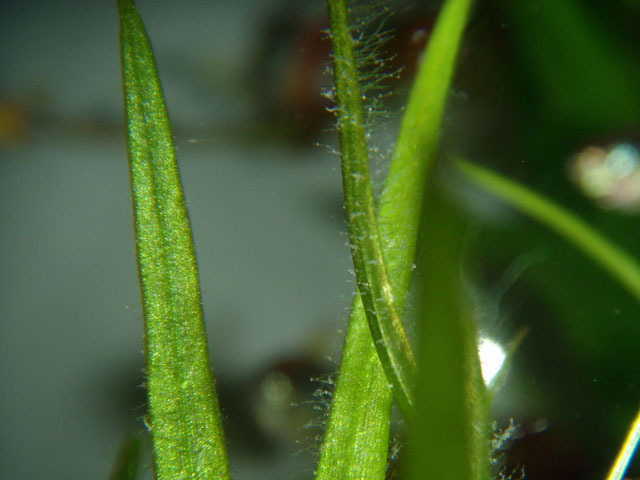 Description Cladophora is a branching, green filamentous algae. Feels a bit rough and sometimes a bit gritty. Cause Low CO2. Low nutrient levels. Removal Can be very stubborn and difficult to eradicate. Make sure your dosing is good and keep your CO2 levels high. Manually pull out every bit you can see until it stops growing. May take a while but should work eventually. Make sure water circulation is good. Overdosing Flourish Excel, EasyCarbo or TNC Carbon may clear it. Amano shrimp sometimes eat it. 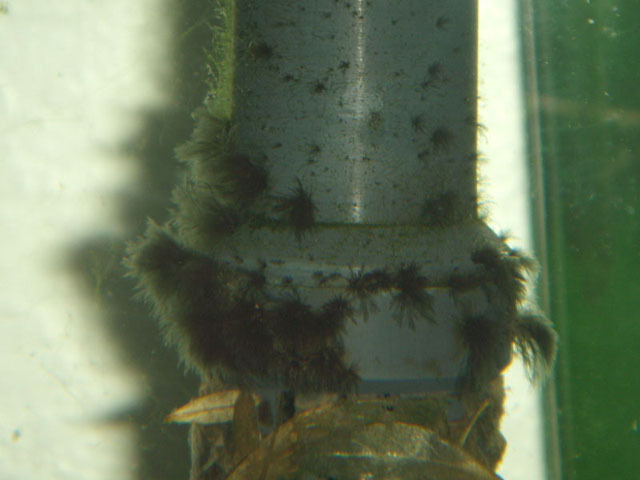 Description Forms in brown patches on the glass, substrate and plants. 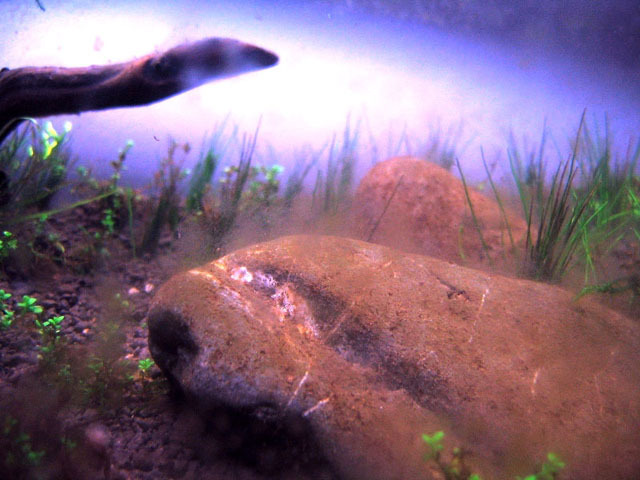 Cause Usually found in newly setup tanks due to silicates and ammonia as the filter and substrate have yet to mature. Removal Can be vacuumed out or wiped of the glass with a soft cloth. Usually disappears after a few weeks when the tank has matured. Otocinclus will eat it. Description Forms on the glass creating a dusty appearance across the glass. Sometimes so bad you can't see into the tank. Cause Low CO2. Low nutrients. Quite common on new setups. Removal Easily removed with a magnetic glass scraper or similar. Often reappears very quickly. 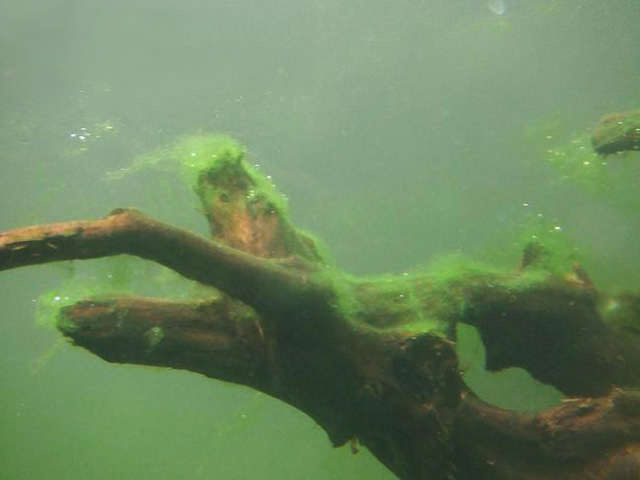 Allow the algae to run its full cycle by leaving it well alone for 3 weeks. It may become unsightly but just bear with it. Then scrape it all off and do a large water change. Sometimes requires a second treatment to fully clear and leaving it for 4 weeks. Recommended to slightly reduce dosing during treatment. Description Forms hard green circular spots on the glass and slow growing plant leaves. Cause With Estimative Index low phosphate levels often bring on a GSA outbreak. Also Low CO2 and poor water flow. Too long a lighting period doesn't help. Removal If dosing Estimative Index increase phosphate levels by adding monobasic potassium phosphate or fleet enema solution. Aim for a level of 2 to 3ppm. Check CO2 levels and water flow. Can be scraped off the glass using a razor blade or a good magnetic glass scraper. Between 9 and 10 hours is plenty of lighting time for the plants. If it is more then reducing it may help. If dosing a lean dosing method like PMDD or PPS-Pro then modifying the NO3 to PO4 ratio normally helps. A bit of trial and error may be required. Description This is a unicellular algae. Water goes cloudy. Sometimes just a green tint, other times it can look like pea soup. 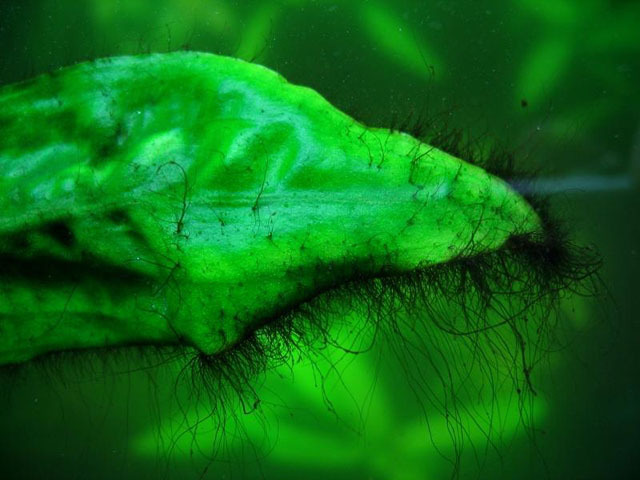 Cause Ammonia is often the main cause green water. There may have been an ammonia spike that isn't detected with test kits. Other possible causes are an imbalance of nutrients and/or low CO2 levels. Removal Large water changes do not seem to always help. If there is an imbalance in nutrients then fixing it will sometimes make it go away by itself after a while. A three day blackout followed by a large water change will hit it hard and sometimes may clear it. 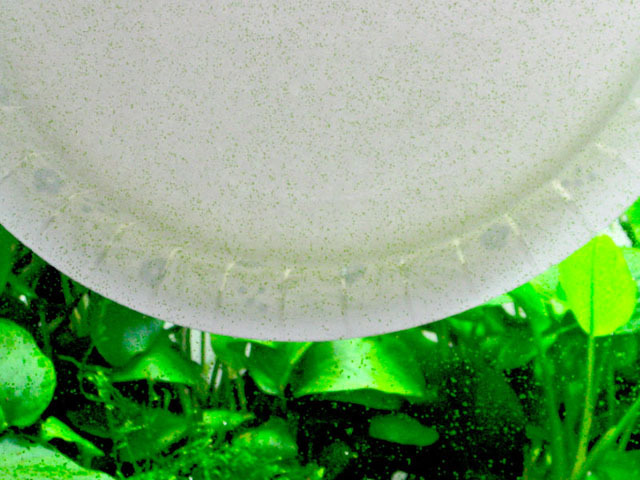 A UV steriliser/clarifier or diatom filter will clear it up very quickly and is often the only way to clear it. A new method is to use freshly cut 1-2 year old willow branches about 0.5-1cm in width. 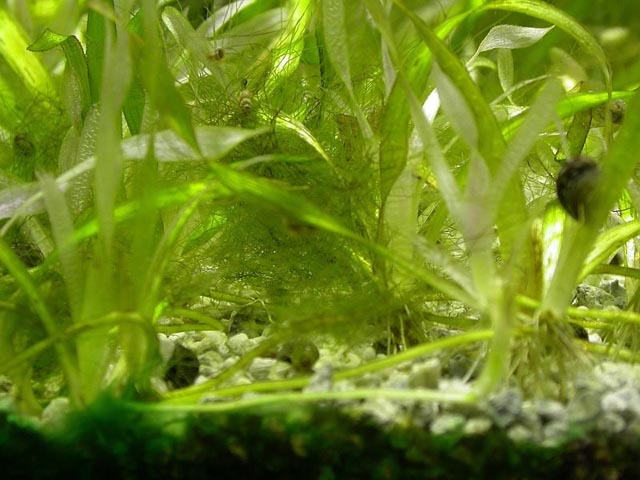 Place these in your tank vertically so they go from the substrate to a few centimetres above the water's surface. After a few days they will start to grow roots and the green water should start to clear. When cleared remove the branches from the water. Don't confuse this with a bacterial bloom which gives the water a white haze. 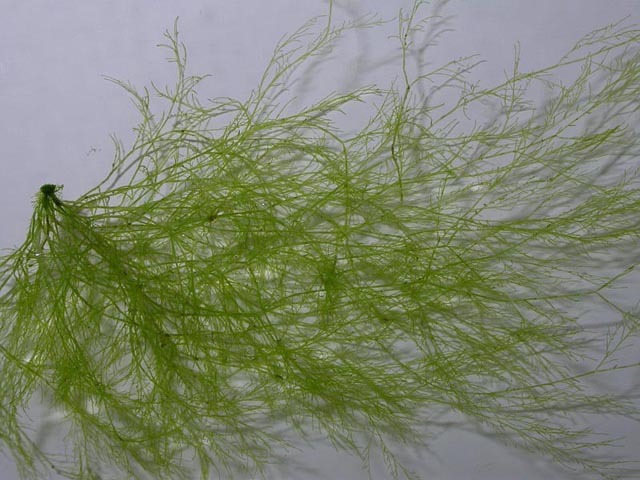 Description These are very general names for a wide variety of filamentous algae. Generally green and varying in length. 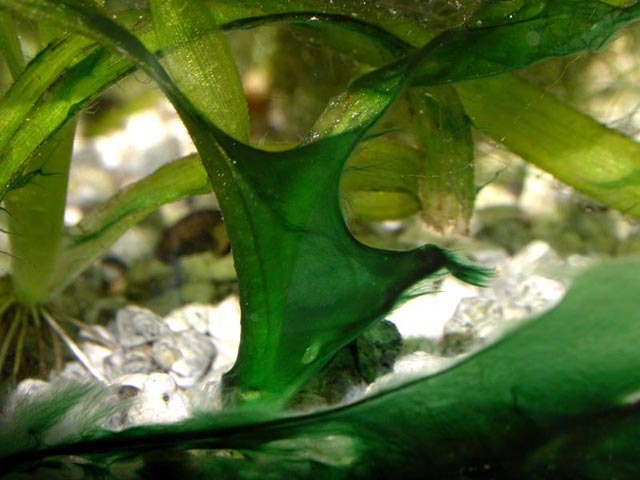 I have listed some of the more popular filamentous algae under their own section on this page. Cause A range of causes including low CO2, low nutrient levels and ammonia spikes. Nothing to do with excess iron as commonly thought. Removal Can be very difficult to eradicate at times. A high plant mass with good CO2 and a good supply of nutrients along with constantly hassling the algae seems to pay off after a while. Removal by twisting around a toothbrush or similar. Overdosing Flourish Excel, EasyCarbo or TNC Carbon can help. 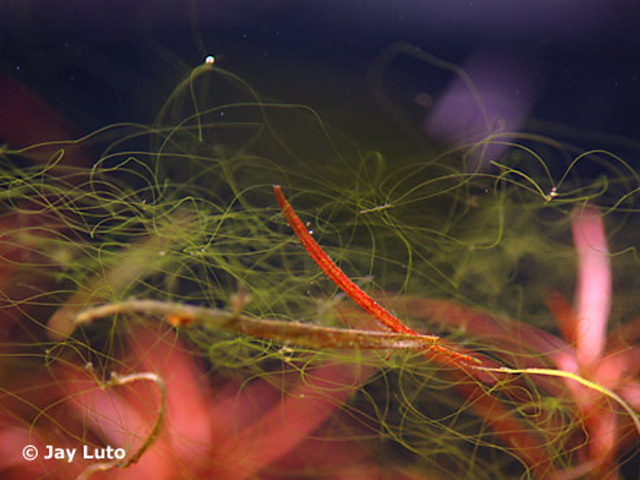 Amano shrimps, Rosy barbs and mollies will often eat it. 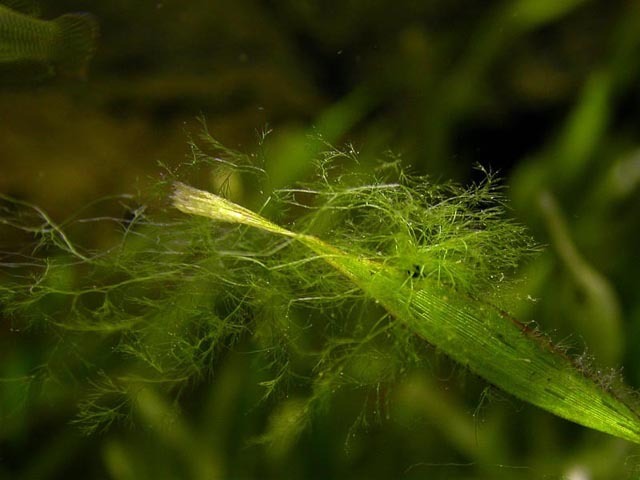 Description A fairly short length filamentous algae that can give a fuzz look to plants. Cause Low CO2. Low nutrients. Removal Check CO2 levels. Add nutrients. Overdosing Flourish Excel, EasyCarbo or TNC Carbon can help. Amano shrimps, Rosy barbs and mollies will often eat it. 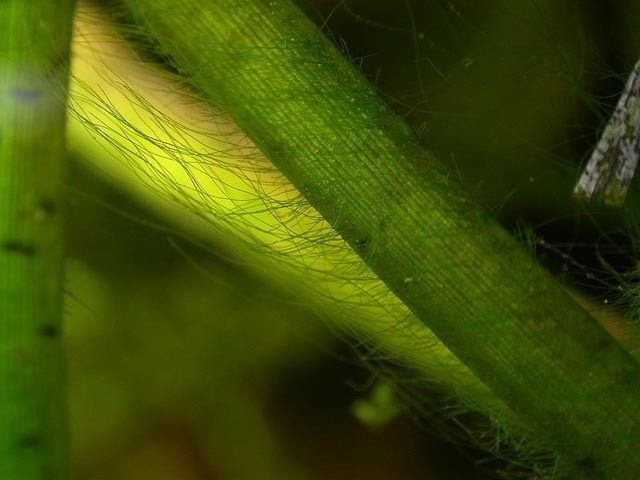 Description Strands of fine green or brownish threads which are soft and slimy. Cause Low CO2 and poor water flow. Low nutrient levels. General lack of maintenance. Removal Increase CO2 levels and check nutrient dosing. Give the tank a good cleaning. Overdosing Excel, EasyCarbo or TNC Carbon should also clear it. Amano shrimp will eat it. 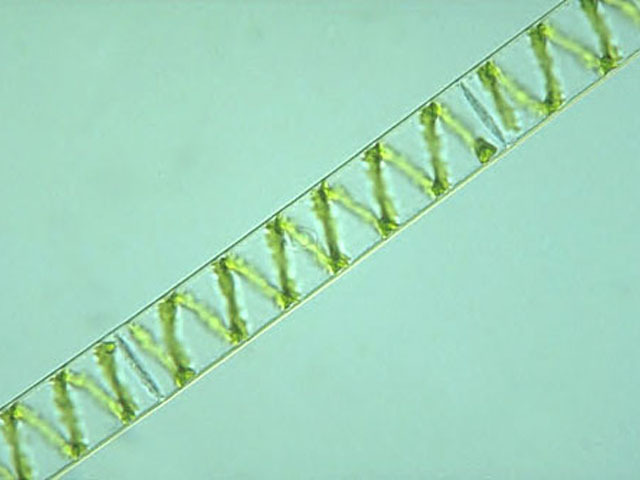 Description Fine strands of green algae sometimes very long in length. Slimy to the touch. Under a microscope the chloroplasts are aligned in a spiral - hence the name. Cause Often appears a couple of weeks after a disturbance that causes a spike in ammonia. This can be anything from a disturbance of the substrate to a dead fish gone unnoticed. Likes high light levels and high nutrient levels. Removal Once it has appeared it can be very hard to clear as it thrives in the same conditions as plants. Pick out as much as possible and do a three day blackout with CO2 turned off and doing large daily water changes. Dose back with macros after the water change. Afterwards I found normal dosing Excel also helped, you could use EasyCarbo or TNC Carbon also. Rosy barbs will eat it if made hungry. Also try reducing the lighting. Another method to try is to try lean dosing at around 1/4 to 1/8 Estimative Index levels for a few weeks. I had good success doing this. Description Grows in strands that branches out. Looks a bit like deer antler. Black to grey/green in colour and sometimes has a red tint. Cause Low CO2 and/or poor water circulation. 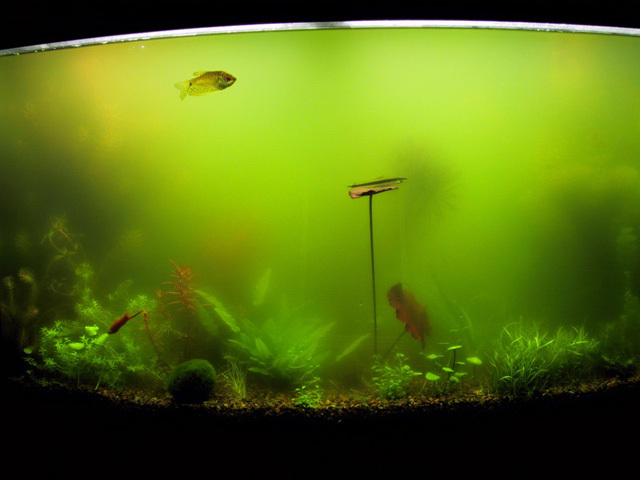 A tank with overfed fish and accumulated mulm. Dirty filter. 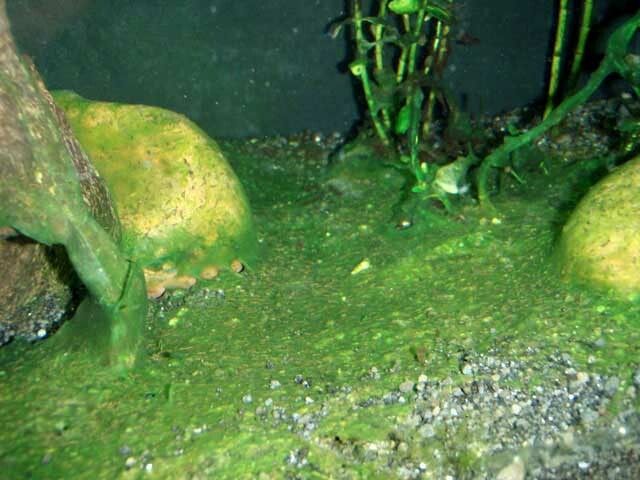 Also disturbing dirty substrates without doing water change afterwards. Removal Check CO2 levels and make sure you have good water circulation. Reduce feeding, vacuum the substrate and remove mulm. Overdosing Flourish Excel, EasyCarbo or TNC Carbon usually helps. 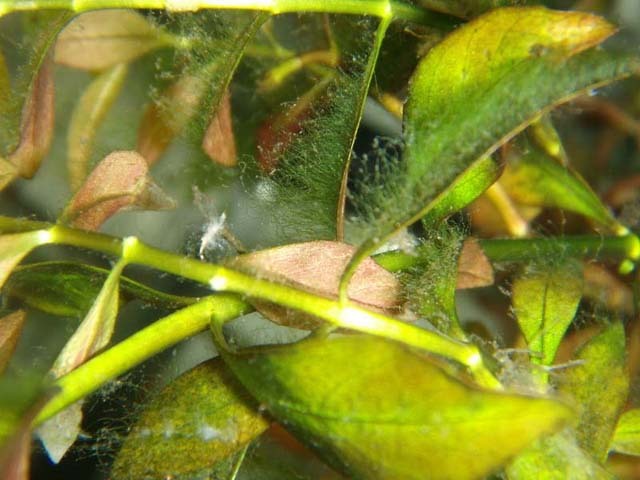 Insufficient, fluctuating or poor distribution of CO2 are nearly always at the root of algae issues in high light planted tanks, but measuring it can often be problematic and misleading. There are 3 common methods used for calculating CO2 levels. The most common method for measuring CO2 is by using the KH/pH tables. These can give false results especially if you have any wood in your tank. The results will tend to suggest that you have higher levels of CO2 than actual levels. This is why you often see people having in excess of 100ppm CO2. The one ph drop method involves leaving a cup of tank water standing for 24 hours. If the pH of the tank water is one point lower than the water in the cup then it is said you have 30ppm CO2. This does presume that you have 3ppm CO2 in the cup of tank water which very rarely is the case. The drop checker method uses a drop checker with a KH4 reference solution and a couple of drops of bromo blue pH solution. When the colour is green, CO2 is good, blue too low and yellow is too high. I like this method and use it as an early warning system on my tank, but it does require getting used to the colour changes. If your CO2 is turned off at night then turn it on about 2 hours before lights on. You want CO2 levels to be at optimum levels when the lights are turned on. Check levels to make sure that they are good and compare morning to evening figures. You need to have stable CO2 levels through the whole of the lighting period. 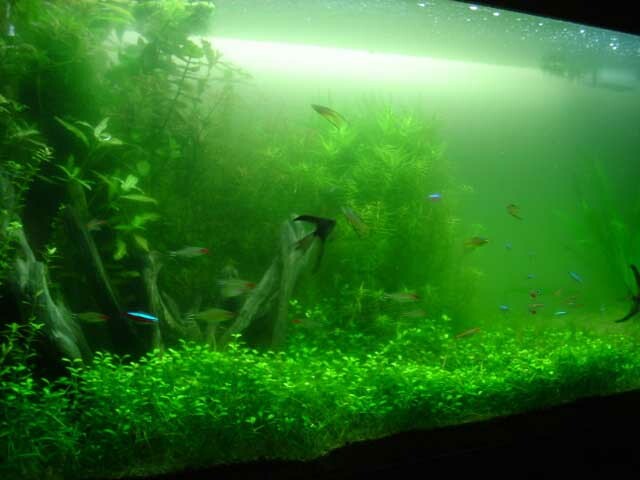 Also of high importance to help prevent algae is having a good flow of water around the whole tank. As a guide try to aim for 10x or more the rated filter flow rate to tank size. The idea of this is to provide a constant supply of CO2 and nutrients to the plants by having them move across the leave's surfaces. If you can see all you plants gently swaying then your flow should be good. Seachem Flourish Excel, Easylife EasyCarbo and TNC Carbon from The Nutrient Company can be used to fight algae issues and they do seem to work very well against certain types. You can either dose as instructions or two to three times overdose for about two weeks to hit the algae hard. 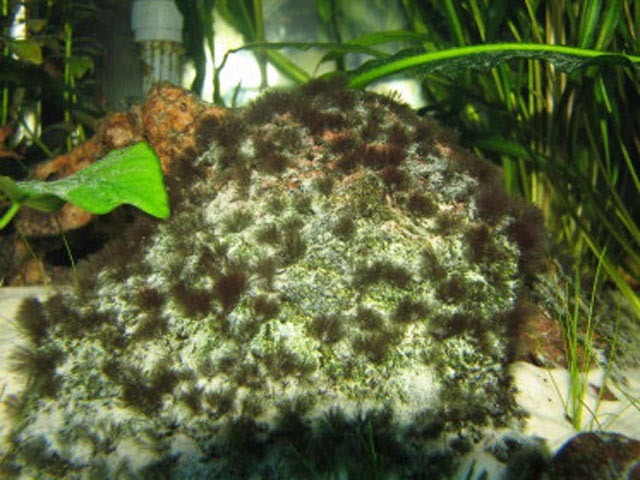 They mainly kill BBA, but also can have an effect on cladophora, staghorn and hair algae. They do affect some plants though. 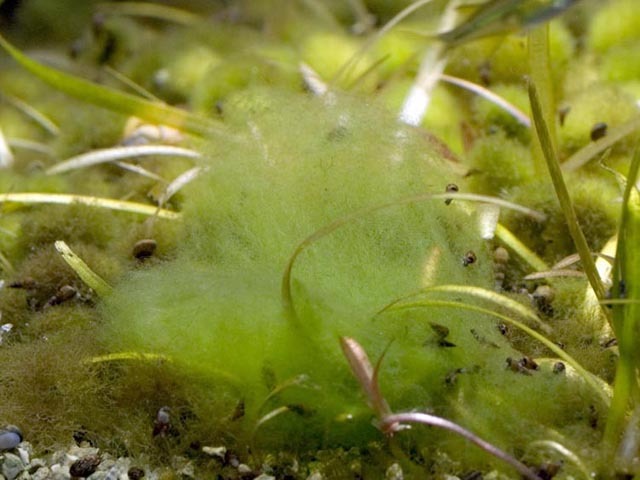 The ones I'm aware of are Egeria Densa, Riccia, Vallis and Fissidens. Some people also report it affecting shrimp and ottos. Another trick is to mix 1 part Excel/EasyCarbo/TNC Carbon to 3 parts water and add to a sprayer. 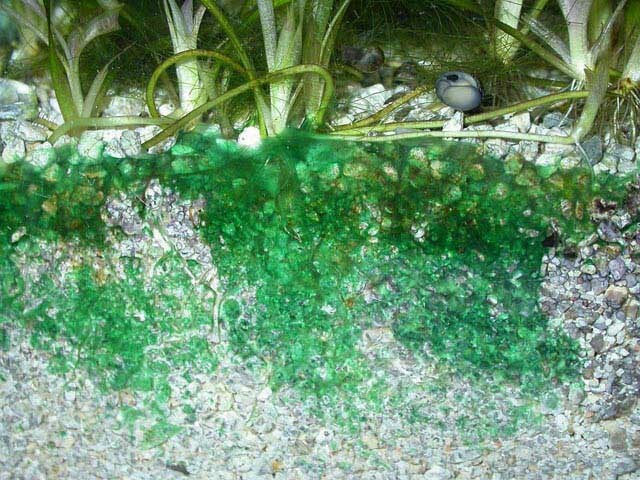 Do a large water change and whilst the water level is low spray the exposed algae. Leave for 5 to 10 minutes and then fill up with water. Thanks to the forum members of The Planted Tank, Aquatic Plant Central and The Barr Report for allowing me to use their photos. All photo's are copyright and may not be copied.